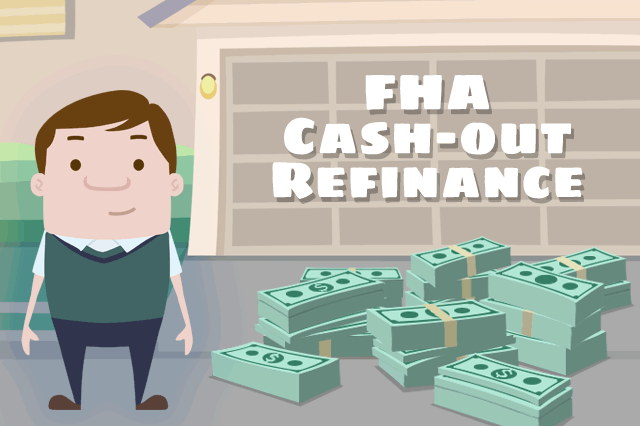 How Should I Use My FHA Cash-Out Refinance Money? FHA cash-out refinance money is good for any purpose the borrower wants to use it for; the cash-out refi loan is different in that respect than a refinance loan to rehab a house (FHA 203(k) loans, for example) or to purchase and rehab a home. August 19, 2018 - FHA cash-out refinance money is good for any purpose the borrower wants to use it for; the cash-out refi loan is different in that respect than a refinance loan to rehab a house (FHA 203(k) loans, for example) or to purchase and rehab a home. The loan funds made available for these mortgages not designated as FHA Cash-Out Refinance loans cannot go to the borrower in cash. Instead such funds must be paid directly to the contractor or service provider, often via escrow. FHA Cash-Out Refinance loans give cash directly to the borrower once the expenses of the loan and the original mortgage are paid off. Home prices are going up (also known as appreciation) and many are considering their cash out refi loan options as a result. A higher appraisal amount means a better deal for the borrower in terms of cash back. So how to use such money when you do cash in on rising property values and equity in your home? Some borrowers who apply for FHA loans may cash in stocks, bonds, treasury bills, or other investments to come up with a suitable down payment. Whether you did this or not, using cash out refinance loan money to add to or replace investments may be a sound use of your new money depending on your financial needs and goals. Some borrowers choose to do home improvements with cash out refi funds, but others ask an important question. Why should you use cash-out refinance loan money to perform home improvements when an FHA rehab loan such as the 203(k) could work just as well? The short answer for some borrowers is that when you use cash out refinance loan funds, there are no restrictions on the type of projects you can do with that money. A borrower who applies for a limited 203(k) rehab loan or refinance loan is limited to approved projects that don’t affect the structural integrity of the home. A borrower who applies for the standard 203(k) is restricted from using those loan funds (refi or new purchase) from adding so-called luxury items to the property such as a new swimming pool, barbecue pit, etc. Refinancing with an FHA cash out loan would permit you to add the swimming pool or barbecue pit or other luxury additions not permitted with an FHA rehab loan. FHA Cash-Out Refinance loans can also be used to pay down student loans, credit card debt, or even to put toward the purchase of a vacation home or second home. FHA home loan rules don’t allow a new purchase FHA mortgage for a vacation home or timeshare, but cash out refinance loans could be a source of funds for such a purchase with a non-FHA loan.